Set on a long English summer in the early 80’s, SON OF RAMBOW is a comedy about friendship, faith and the tough business of growing up. SON OF RAMBOW is the name of the home movie made by two little boys with a big video camera and even bigger ambitions. Those 2 boys give an unbelievable performance, seeing as they had no acting experience whatsoever before this film. The smallest of the two is lovely and has incredible talent, and he has the right name too. His name is Bill. In real life. The film being set in the 80’s guarantees you a lot of songs from the time we (as in people my age) were young. Very enjoyable. Also, the genius who created the soundtrack for Hitchhikers Guide (which is brilliant), also created the soundtrack for this film. This means fantastic quirkily composed bits of music that lift the film to a higher level. If you are British you should see this film even more as you will go on a trip on memory lane, back to school. Did I mention that it is a highly original and well written story? It is very touching too. And charming. And warm hearted. And very imaginative. Afterwards there was a Q&A with Garth Jennings, who also just turned out to be a lovely man to listen to. It took them 8 years to get this film made, and his stories about how they tried to sell the film, getting “we don’t think children films are hot right now” were both funny and inspiring. This is not only a children movie, the cinema was filled with grown ups yesterday and they all roared at times. The two kids who were attending this sneak preview did love the film too. I can’t imagine you would not. Brave and imaginative films like these are rare but a real treat. Go see it! I’m definitely taking my Odeon voucher to see this one. I’m wondering if it would play well at work, our audience is mainly late middle-age but if it gets goods reviews they might come out of the woodwork to see it. @grigorisgirl: I am sure you will like this film. If your audience still is young at heart they will love it too. I will see it again next weekend. Ingrid, I know this is completely off topic: We just came home from the cinema where we have seen ‘Dan in Real Life’. You were so right about this film. It is lovely, funny, emotional, absolutely worth seeing. We laughed and we (or rather: I) cried. On our way home we repeated the scenes we remembered, and we laughed again. I am still smiling now. And the sound track is nice, too. Thanks for recommending it. @Zazz: I am so glad you liked it! Really glad, because I realize how much I have been rambling about it. And I laughed and cried (twice! one time with Dan singing and where his lilltle girl tells him to go after the woman he loves). PS You have to put this one (Son of Rambow) on your list of -must-see too, it’s great. I sure will. Just watched the trailer. I don’t think I will take my (8-year-old) son along, though. It might give him ideas. 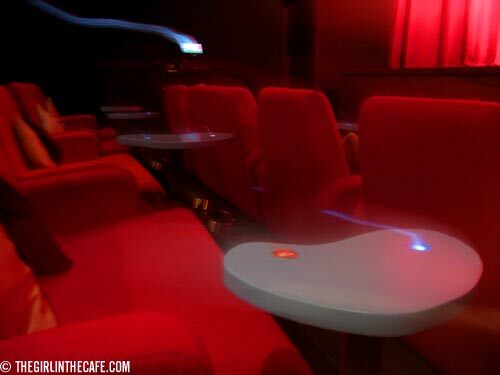 I’m definitely going to check out this cinema – looks so much better than my local sticky-floored flea-pit! @Dave: it is not exactly in your neck of the woods, but I’d say it is worth the trip if you would like an evening of indulgence. It is a lovely cinema, and you can climb Parliament Hill while you are in the area, which has a very nice view over London. I have to say I walked past the posters for this with a certain grumpy air, “Rambo, like II’d watch that”, but I have just seen a feature about this on the TV and, OK, I was wrong ..
How lovely that looks – a cinema that still understands that you may well be there on a date!